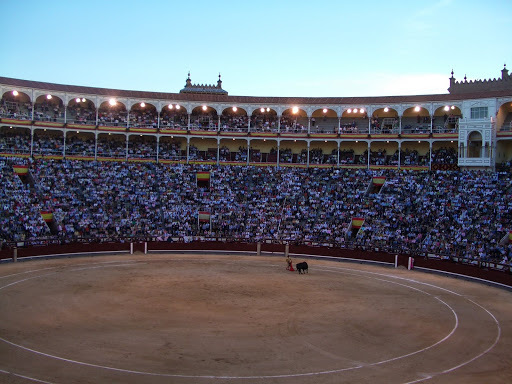 A ticket to the bullfight in the Plaza de Toros in Madrid gets you a seat in the amphitheater to watch six bullfights. 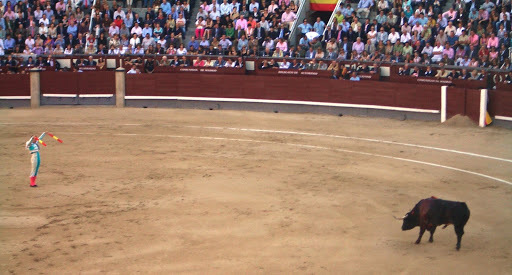 A traditional Spanish bullfight, or corrida, has several stages. 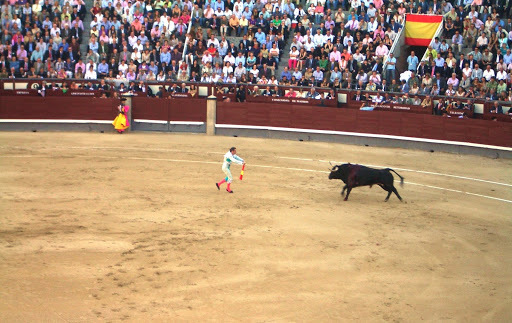 First, the bull is released into the ring and the banderilleros, with their colorful pink capes, come out and taunt the bull and then dodge behind the protective wooden partitions. The idea, of course, is to show off to the crowd how dangerous the bull is (and allow the matador, watching from the sideline, to get an idea of the bull’s speed and strength). Mounted on their heavily padded horses, the mounted picadores take on the bull. 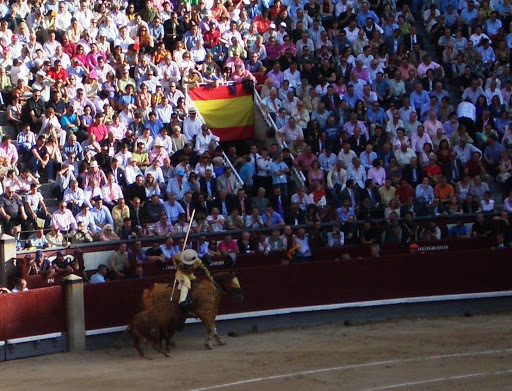 As the bull tries to ram its horns into the horse, the picadores drive their long spear into the bull’s back. The idea is to get the bull to lower its head to prepare for the real bullfight. If the bull won’t relent from ramming the horse, the banderilleros try to distract the bull with their capes. Next the matador comes out into the ring. He is the real star of the show. If he wants to, he can dedicate the bull to an individual or the crowd. Before killing the bull, there are six hooked sticks that he links onto the bull’s back. He hooks them on two at a time by masterfully luring the bull to him, hooking the sticks, and then dodging out of range of the bull’s deadly horns, all within the blink of an eye. Next comes the climax of the corrida. The bull’s back is now covered in blood from the picador’s spear and the six hooked sticks hanging from it. The sticks themselves make the corrida more exciting and more dangerous; they are jabbed into the bull and flapping at his sides, irritating him and making him angrier and more determined to charge at the matador. It is now the matador’s task to kill the bull by stabbing a short sword into the base of the bull’s neck. This must be done with precision, because if the bull isn’t killed instantly and has to suffer, the crowd will boo the matador from the stadium. 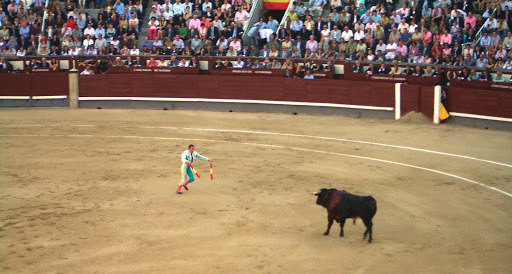 However, the kill must be done quickly, because the matador has to reach over the bull’s horns and stab it in the base of the neck as the bull is charging at him. 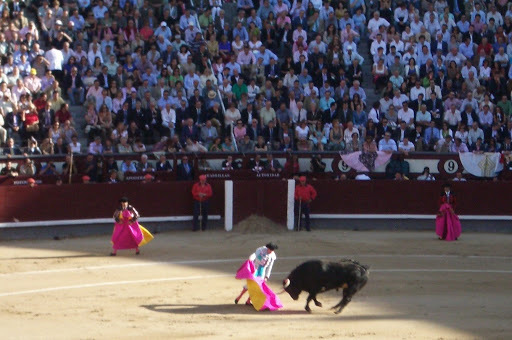 The matador uses his red cape to lure the bull (only matadors can use the red cape; the capes of the banderilleros are pink). Once it is all over and the bull has been killed, one of its ears is cut off and saved as a souvenir or trophy for the matador or for one of his sponsors. An announcer comes out bearing a sign that lists the bull’s age and weight and the bull-breeding company he came from; the sign-bearer shows this to the crowd. Then a team of men comes, throws a rope around the bull’s neck, and attaches it to a team of horses. Then the carcass of the bull is dragged around the ring and then out of the stadium, leaving a trail of blood behind it. Every part of the bullfight is an art form. If the picadores drive the spear into the bull’s back too much, and the bull loses too much blood, then the bull will be weakened and it will be a lame bullfight. If, however, the picador doesn’t get the bull to lower his head enough, the matador could be injured or killed. 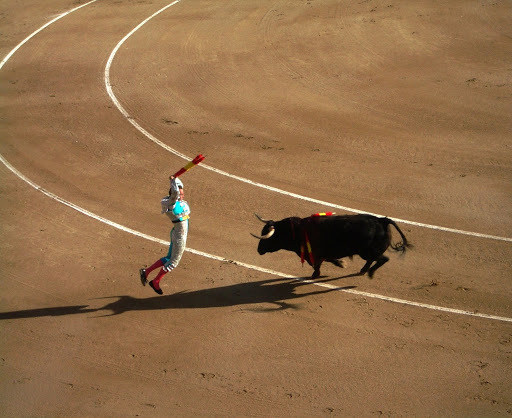 Likewise, the matador has to kill the bull in one quick, clean stroke—there is no room for error. As he artfully lures the bull to him and then dodges just out of death’s reach, the matador’s graceful movements are as much dance as they are any kind of sport. In fact, the results of each night’s bullfight appear in Madrid newspapers in the arts section, next to theater and dance reviews, rather than in the sports section with the results of soccer games. 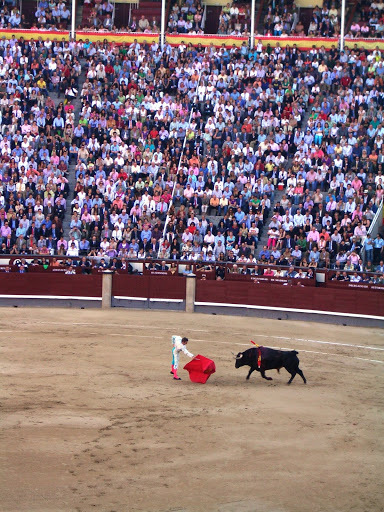 But of course, the real draw of the bullfight is its quick-paced action and risky excitement. 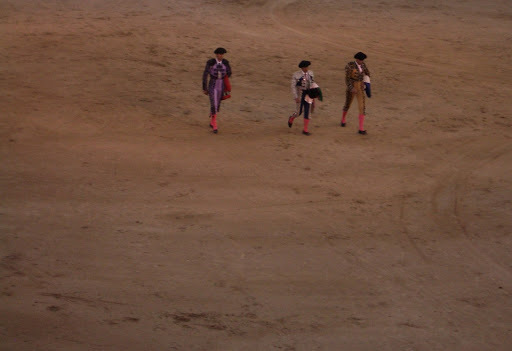 The matadors literally stare down death. We watched six corridas; during one of them, the bull charged at the picador with so much force that the picador was knocked from his horse and over the wall into the crowd! And it took the help of all the banderilleros and two referees to distract the bull, calm the horse, and get the picador safely mounted on his horse again to continue the corrida. The scariest moment, though, was during the third corrida. The matador lured the bull over but as he went to stab him, the bull was too quick. He rammed the matador off his feet and we watched in horror as the bull proceeded to stamp his feet over the matador’s body. 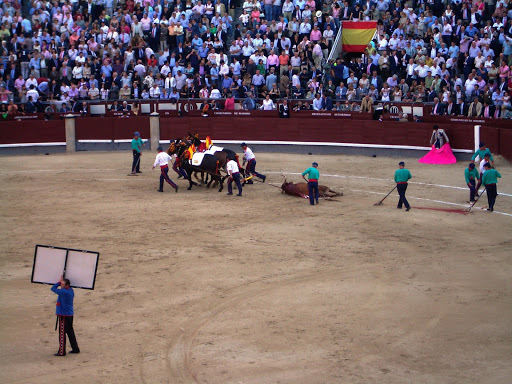 One of the banderilleros ran out to distract the bull while the others picked up the matador and carried him unconscious from the stadium, his head bleeding profusely. The crowd all stood up for the matador as he was carried from the ring. I don’t know what happened to him or how badly he was injured. So is it violent? Extremely. Bloody and violent and not for the faint of heart. But also really exciting, and a truly Spanish experience. 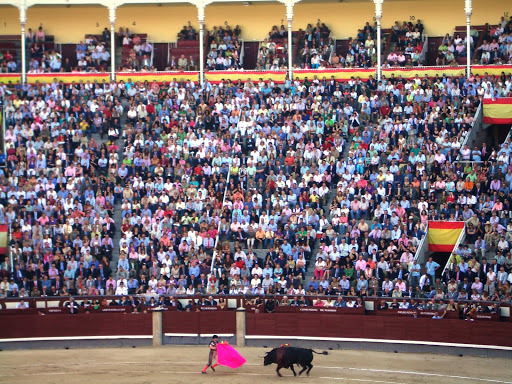 Every city in Spain—from booming Madrid to the tiny little pueblos—has its own plaza de toros. Since Spain was the first place after the Italian peninsula to be conquered by Rome, it’s no wonder. You can see how the human vs. animal fights carried out in the Roman amphitheater evolved into this very old Spanish tradition. Our seats were in row 18, about a third of the way up from the bottom. We were surrounded by old Spanish men who puffed their cigars and yelled agitatedly to whoever would listen: “No, no, no…ahora si!” “Ay ay ay!” “Que fuerte el toro!” That was probably the most fun thing about it: the atmosphere. The band played and air pulsed with the beat of thousands of people fanning themselves with Spanish paper and wood fans to try to keep cool under the hot sun. 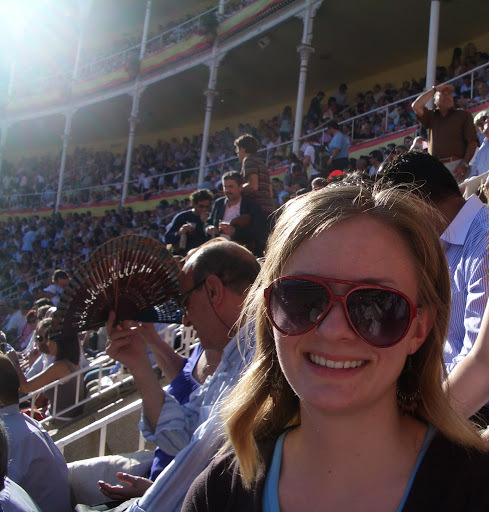 We sat in the plaza de toros that has housed Madrid’s bullfights for eighty years. We breathed in all kinds of cigar smoke and watched six bulls get slaughtered, and I think it’s the most fun I’ve had in a long time. Brilliant. I had no idea it was so bloody! Kimberly! How are you?? I just found your blog and I didn't know you were in Spain, that's awesome. I spent a term there so looking at all your pictures and totally brings me back. It's such a great, colorful country. I hope you have a fabulous time. You look great! So it's the Festival of San Fermin right now, right? Does that mean it is Bullfight season? Like baseball season or basketball season?Or are they ongoing, because they're more of an art than a sport?Or are they ongoing due to tourism?